This recipe is not only gluten, soy and dairy free but grain-free as well. For these Grain Free Chicken Tenders I used almond flour instead of bread crumbs and although they are fried I used healthy coconut oil to do so. Personally, I think this recipe tastes better then the traditional breaded version and is one that everyone can enjoy!. Additionally, this recipe can be used to make many other fried foods and yields a nice crispy crust. I have used it to make a variety of fried veggies and fish tenders as well. 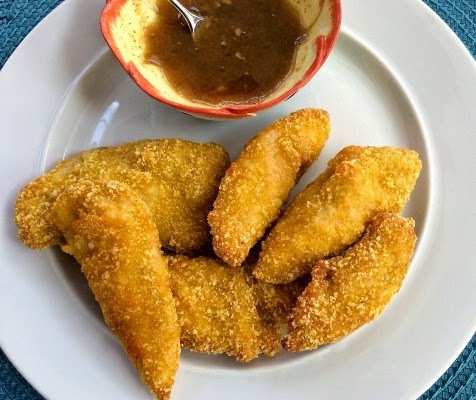 A Honey Mustard dipping sauce is the perfect condiment to serve alongside these chicken tenders. In a medium bowl beat the eggs with the non dairy milk. Add the chicken strips and toss well. In a second bowl, combine almond flour, garlic powder, onion salt and paprika. Over medium to high heat on the stovetop, heat the coconut oil in a large skillet. Once oil is hot, coat chicken in egg mixture and then dredge in almond flour mixture and place in pan. Cook 3-4 minutes per side or until golden brown and cooked through. Remove from pan and keep in oven to keep warm while additional batches are cooking. Once all are cooked through, sprinkle with additional salt and pepper and serve with (optional) honey mustard sauce. Whisk together the honey, mustard and paprika in a small bowl. Serve along side the chicken tenders. Enjoy! sounds amazing! I'm having some folks over for dinner that don't have any allergies, so I'm trying to find something to make that they will enjoy as well as me (a celiac who is off all grains ;)). This is definitely going in my recipe folder! This looks like a great recipe for Chicken Tenders! Thanks so much for sharing this awesome recipe with Full Plate Thursday. Hope you are having a great weekend and come back to see us real soon!